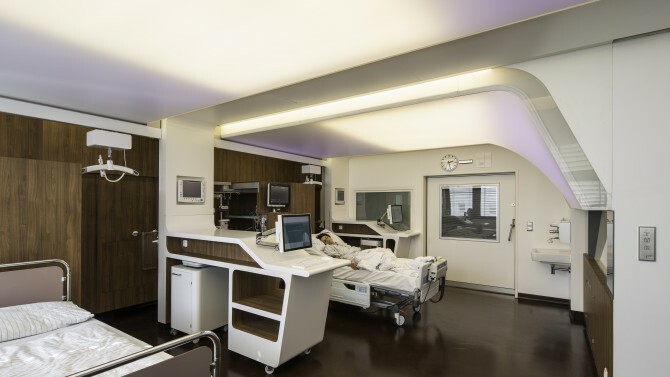 In two new pilot-program intensive care rooms at the Campus Virchow-Klinikum Charité techni­cal equipment is relegated to the background and the visual environment can be adapted to the condition of patients. 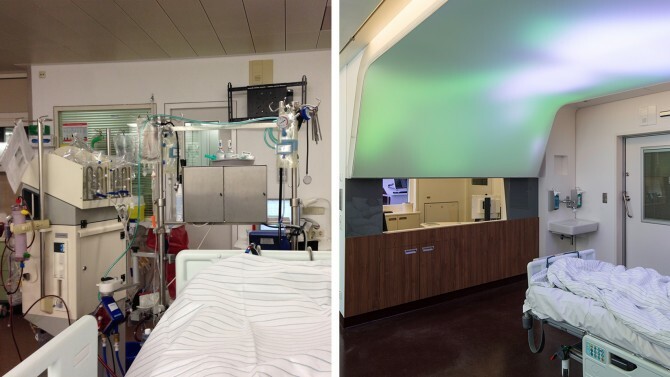 This intensive care unit is the result of a three-year collaborative research and development. A central component of the interior room con­cept, designed by GRAFT Architects, is a large-format screen installed above the bed. The screen is curved down so that it fills the pa­tient’s field of vision. Built in cooperation with Philips, the screen’s coloured light is produced by 4000 LEDs. 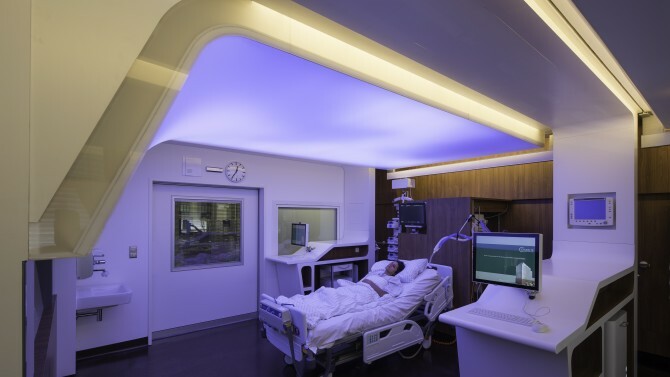 In addition to the RGB LEDs, high-powered, hot and cold white LEDs have been integrated, which, with an illuminance value of 20,000 lux, approxi­mates the brightness of a daylight sky. 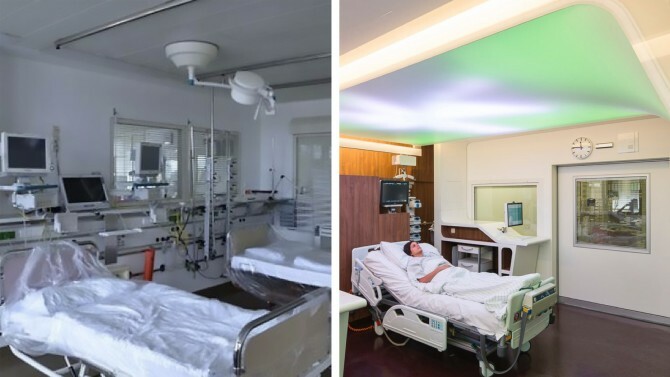 ART+COM developed the media content, based on scientific findings and theories, in close colla­boration with the Department of Anaesthe­sio­logy and Operative Intensive Care Medicine at the Charité. The media content is intended to help patients to, for example, reorient them­selves after major surgery or when coming out of a coma. The visual content is inspired by natural pheno­mena and connects patients to the outside world. It should be cognitively stimula­ting, as well as stress and anxiety relieving, enabling the dosages of pain medication and sedatives to be reduced and the healing process of patients to be improved. 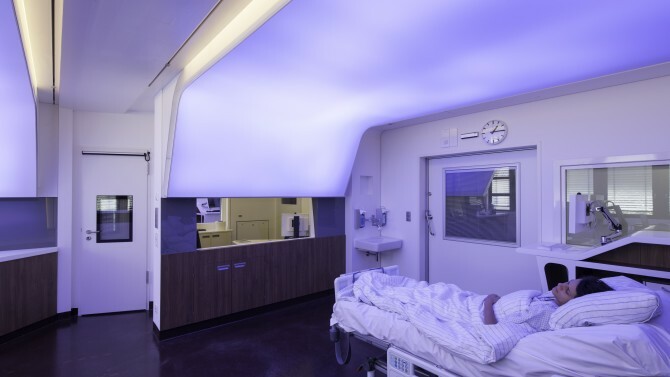 Central to the approach is the design of a day-night rhythm simulation that promotes natural sleep and can be protective against acute cognitive deficits, or ‘delirium’, in patients. The colour of the screen changes depending on the time of day, simulating the light spectrum of an entire 24-hour period. Current weather patterns (local or from anywhere in the world) are included, and the simulated sky changes accordingly. The clouds might be more dense, for example, or perhaps moving more quickly. Moving objects like birds and contrails also stimulate patient cognition. 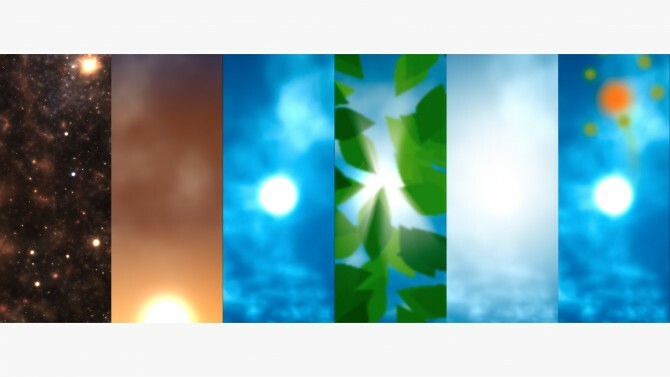 In other content intended to reduce pain and anxiety, virtual leaves float down onto the screen. The colour, size, thickness and shape of the leaves can be adjusted to an individual patient’s condition. If these parameters are supplemented by weather patterns, a breeze can gently affect the leaves based on current wind levels. 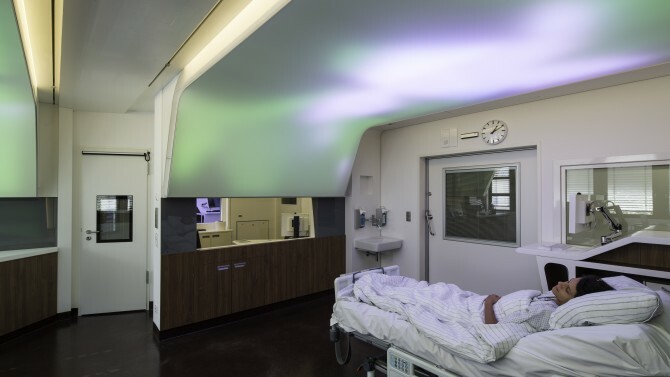 Intensive care patients that are awake at night are offered a choice of two visualisations: a quiet starry night or a view of moving points of light reminiscent of the dance of fireflies and that stimulates cognition. 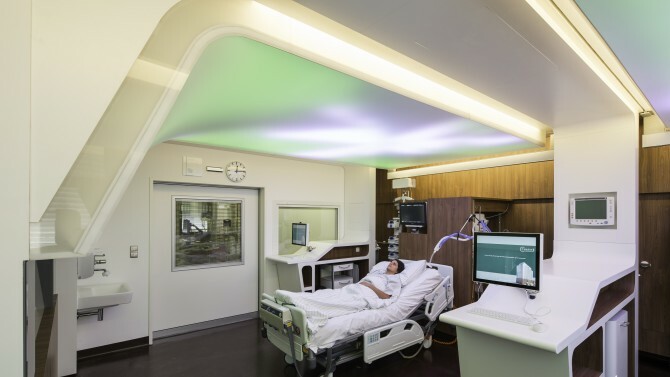 The screen shows variable visualisations that are based on real processes of nature and can be parametrically adjusted by medical per­son­nel to match the condition of individual patients. This is achieved by entering clinically relevant patient data into a specially designed tablet interface. The project Parametrische (T)Raumgestaltung is a joint research initiative by the Charité – Universitäts­medizin Berlin, GRAFT Architects, ART+COM, and the Charité CFM Facility Manage­ment GmbH. It is funded by the Federal Ministry of Economics and Technology and won the first prize in the Design & Health Management competition organised by the Berlin state initiative Project Future in 2012.